With an abundant harvest of apples from a few old apple trees at our family farm, I decided to create some grain free, "lower-carb" apple desserts. Apples are a fruit that are high in natural sugars. This makes a low-low carb version impossible. I will argue that this doesn't mean we shouldn't enjoy an abundant apple harvest or our favorite treats from time to time. Apples are also loaded with essential vitamins and minerals which help build up our immune system. So, enjoy this apple dessert in moderation. This grain free apple cake is lower in carbohydrates than my apple crisp recipe. It's also a delicious breakfast option and freezes great! 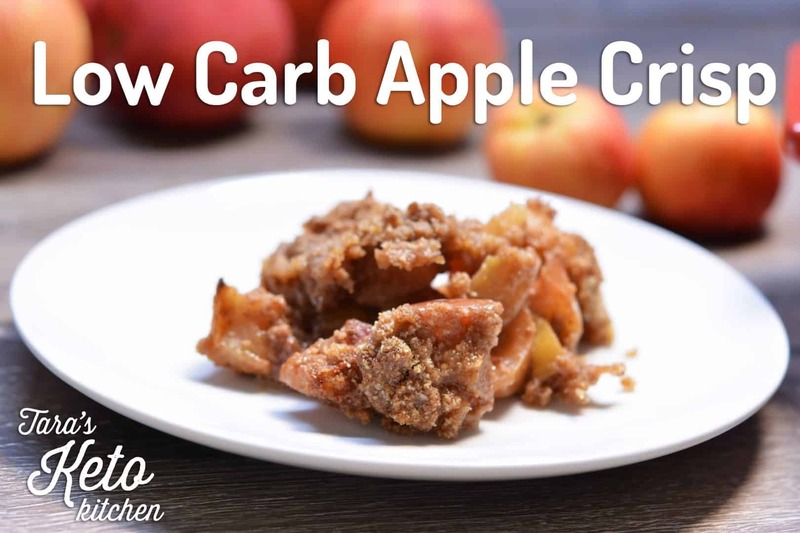 This low carb apple cake is easy to whip up. Pair it with my Keto Caramel sauce for a indulgent dessert. Chop up your apples and toss with 1 tsp lemon juice to prevent browning. Set aside. In a medium sized bowl, combine eggs, melted butter (make sure your melted butter has cooled to room temp), vanilla and almond. Whisk until the wet ingredients are thoroughly combined. In a large mixing bowl, combine coconut flour, almond flour, sweetener, cinnamon, nutmeg, xanthan gum, baking soda, cream of tarter and salt and mix. Mix in the chopped up apples. Pour your batter into your greased 9x9 pan. Cover with foil and bake for 50 minutes. Remove the foil for the last 10 minutes of baking. Eggs: Coconut flour requires many eggs because coconut flour loves eggs and is very absorbant. Using egg-substitutes will generally yield a failed recipe. Swapping Flours: This recipe will not turn out well if you try and substitute the flours. Make sure you use both coconut flour and almond flour with the ratios above. Adjusting Sweetness: This is a pretty sweet cake. If you prefer a cake with less sweetness (or simply want to use less expensive alternative sweetner) , simply cut the sweetner above in half. This same recipe could easily be converted to grain free apple muffins. Instead of baking it in a 9×9 pan, simply bake in muffin tins. My guess on the baking time is 20-25 minutes in a muffin tin. You will be able to tell that the baking is complete by inserting a toothpick in the center. It's done when it comes out clean! Coconut flour requires many eggs because coconut flour loves eggs and is very absorbent. Using egg-substitutes will generally yield a failed recipe. This recipe will not turn out well if you try and substitute the flours. Make sure you use both coconut flour and almond flour with the ratios above. This is a pretty sweet cake. If you prefer a cake with less sweetness (or simply want to use less expensive alternative sweetener) , simply cut the sweetener above in half. Pour your batter into your greased 9×9 pan.